President Barack Obama speaks in Edgartown, Mass., Wednesday, Aug. 20, 2014, about the killing of American journalist James Foley by militants with the Islamic State extremist group. 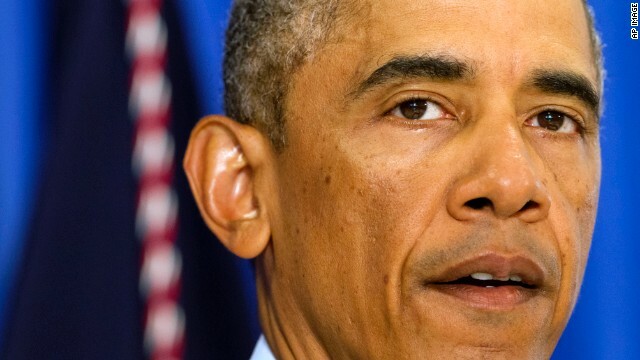 (CNN) Washington - On President Barack Obama’s last day of a troubled vacation, politicians criticized his leadership and called for action in the growing threat of terrorist group ISIS. In the wake of the beheading of American journalist James Foley, administration officials made clear that they are shifting from defensive operations against ISIS in Iraq to weighing an attack on ISIS where they are strongest, in Syria. But politicians on both sides of the aisle are impatient for the President to construct a plan and consult with Congress on what many see as an imminent threat from ISIS, which calls itself the Islamic State and is called ISIL by some U.S. government officials. 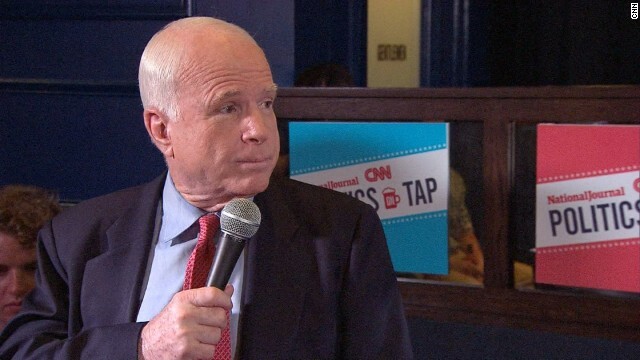 Washington (CNN) - U.S. Sen. John McCain, R-Arizona, is no stranger to the Sunday morning political talk show circuit, and viewers have apparently taken notice. On Sunday, he appeared on CNN’s “State of the Union” from Jakarta, Indonesia, primarily to discuss the U.S. airstrikes on Iraq and President Obama’s foreign policy. However, during the interview, CNN’s Candy Crowley asked him about the frequency of his Sunday show appearances and his regular criticism of Obama. Would there have been fewer troops in Iraq if McCain won the presidency in 2000? 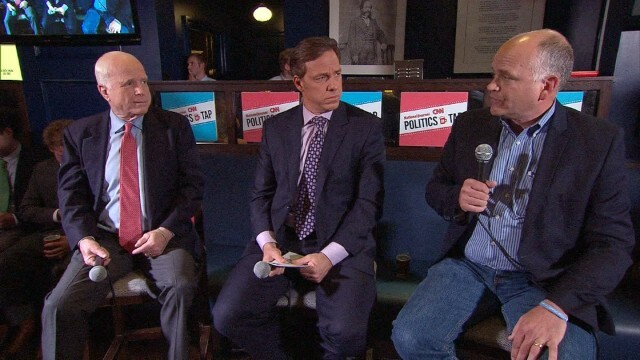 CNN and National Journal joined forces Thursday to explore the 2014 midterm elections at the first "Politics on Tap" event in Washington D.C. Sen. John McCain, R-Arizona, joined CNN’s Jake Tapper, Brianna Keilar and Peter Hamby, as well as National Journal’s Ron Fournier, and Michelle Cottle for the private gathering. Check out some of the best highlights from the event on our Storify page. (CNN) – It’s hard to imagine that one of the most vocal supporters of sending troops to Iraq during the 2007 surge, now says that in hindsight, he would’ve acted differently if he were in charge. Sen. John McCain, R-Arizona, said that had he won the presidential election in 2000, he would’ve been more hesitant about sending troops to Iraq. (CNN) - If the Russians did it, it's their President's fault. That was the message Sen. John McCain delivered after the United States concluded a missile shot down a Malaysia Airlines passenger jet that crashed in a rebel-controlled part of eastern Ukraine on Thursday. While it is unclear who shot down the plane, the Arizona Republican says that if either the Russian government or pro-separatist forces in Ukraine fired the missile, Russian President Vladimir Putin is ultimately responsible for the crash. (CNN) - If the Malaysia airliner in Ukraine was shot down, then the United States will need to take action against the assailants, two Republican senators argued Thursday. "If it is the case, then we're going to have to act and act in the most stringent fashions, including real sanctions, including giving the Ukrainians the ability to defend themselves, which we have not done so far," Sen. John McCain, R-Arizona, said in an interview with CNN's Anderson Cooper. Washington (CNN) – As thousands of unaccompanied children from Central America enter the U.S. along the southern border, Sen. John McCain believes any multi-pronged approach to the crisis must include two key elements: sending the children back to their home countries and securing the border. "There has to be a halt to this … and the best way to do that is for planeloads of these young people to be returning to the country of origin and their families," the Arizona Republican told CNN chief political correspondent Candy Crowley on Sunday on CNN's "State of the Union." 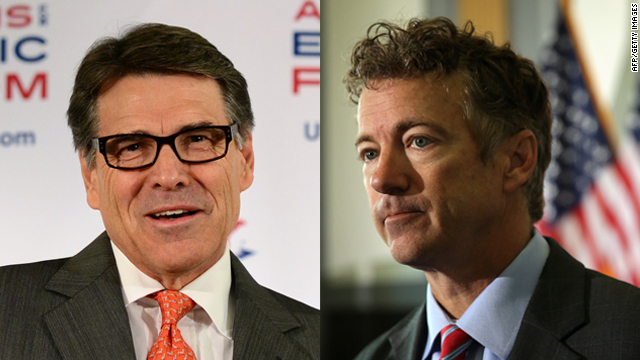 Washington (CNN) - In the Republican-versus-Republican foreign policy feud between Rick Perry and Rand Paul, whose side does John McCain pick? 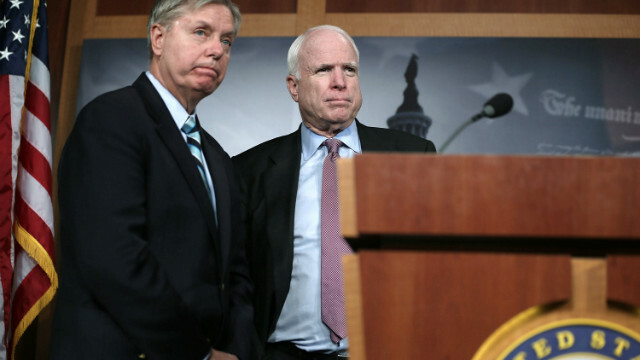 The Arizona senator is not interested in stepping into the political crossfire. But that does not mean he won't offer a lecture. "Sen. Paul is part of a wing of the party that's been there ever since, prior to World War 1, in our Republican Party. And that is a withdrawal to fortress America," McCain told CNN Chief Political Correspondent Candy Crowley on CNN's "State of the Union" on Sunday. "I do believe that the things we're seeing in the world today - in greater turmoil than any time in my lifetime - is a direct result of an absence of American leadership. Washington (CNN) – Sen. John McCain said Sunday the violence roiling the Middle East has likely never been worse, as rockets fall in Israel and Gaza, residents flee, warning sirens blare and the death toll rises. "I would argue that given conditions in the Middle East, this might be more dangerous than any time in the past," the Arizona Republican told CNN chief political correspondent Candy Crowley on CNN's "State of the Union." "Not only conditions domestically, within Israel, but also the fact that Egypt is really not playing the role they traditionally have, countries like Qatar and others that could play a role." Washington (CNN) - As tensions between Israelis and Palestinians ramp up, the United States must begin shuttle diplomacy, according to Sen. John McCain of Arizona. One of the top Senate Republicans, McCain argued that Secretary of State John Kerry should go to the region and initiate a dialogue between the two sides.